In the last post I briefly described how galaxies form within dark matter haloes, which form in time due to gravity starting from the initial fluctuations (seeds) that we can observe in the CMB. If dark matter can collide with itself, then collisions prevent the accumulation of dark matter in the center of haloes (galaxies), distributing energy among adjacent regions. 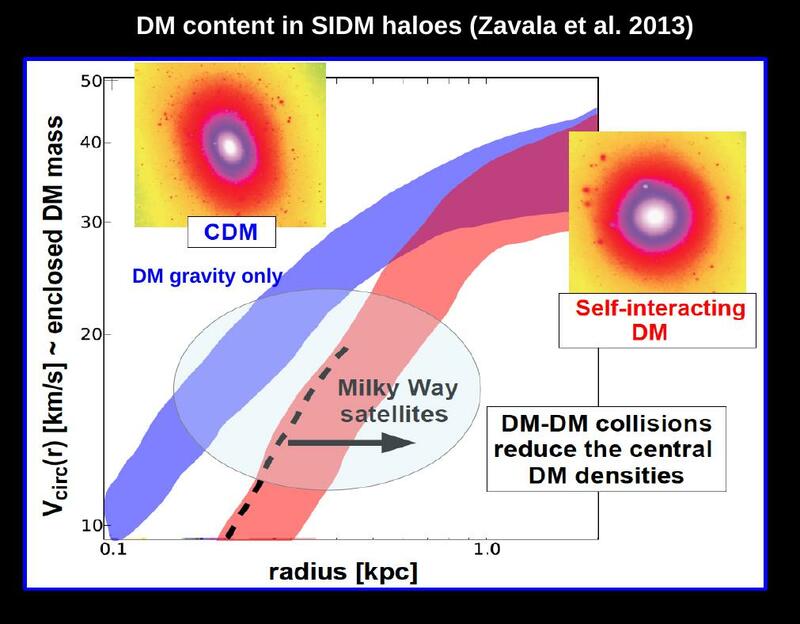 The prediction in SIDM is that haloes have substantially lower central densities (see figure). There is observational evidence coming from the dynamics of stars in nearby low-mass (dwarf) galaxies (e.g. the satellites of the Milky Way), that these galaxies inhabit haloes with central densities lower than expected from a pure CDM model. In the figure, I show schematically the results my collaborators and I obtained from SIDM numerical simulations (these results are published in this article).